Lust for power leads to political turmoil in this fast-paced new distillation of Shakespeare’s epic histories of a nation and its rulers – their lives, their battles and their deaths. Enjoy this epic drama on its own – or follow its exciting sequel in Breath of Kings: Redemption. Production support is generously provided by The Brian Linehan Charitable Foundation and by Martie & Bob Sachs. Support for the 2016 season of the Tom Patterson Theatre is generously provided by Richard Rooney & Laura Dinner. Graham Abbey as King Henry IV and Irene Poole as Sheriff. Photography by David Hou. Johnathan Sousa as Hotspur. Photography by David Hou. Johnathan Sousa as Hotspur and Carly Street as Lady Percy. Photography by David Hou. From left: Kate Hennig as Mistress Quickly, Geraint Wyn Davies as Sir John Falstaff and Nigel Shawn Williams as Bardolph. Photography by David Hou. 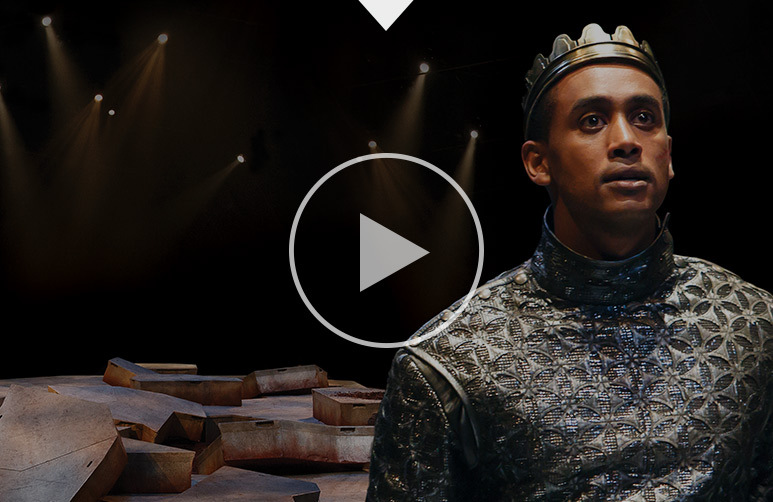 Araya Mengesha as Prince Hal and Mikaela Davies (ensemble). Photography by David Hou.